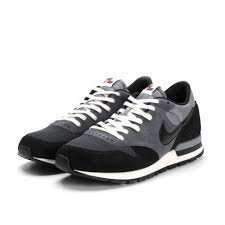 Following in the footsteps of the Nike Internationalist (check COMMENTS for colour variations), Nike presents the Nike Air Epic QS. The shoe features an anthracite mesh base layer with premium black suede overlays to the toe and heel surround and anthracite suede to the medial and lateral side panel. Remaining true to form, the shoe sits atop a white slim midsole, and features vintage-style branding to the tongue and heel. The silhouette is finished with a perforated heel counter to the rear, black swoosh branding to the side walls and comes complete with a set of flat white laces. Thanks a bunch now I own another pair of trainers. Only you and Stevie Wonder think this. Think you should stick to JD's. They sell trainers in Wetherspoons?!! I'd have the green but they were never £85 my price point for these would be between £30 and £45 ? Ive got loads of trainers some of these included. Not voting either way as this is just ok.
dereklogan7. If you only shop at JD Sports then you are limiting yourself to bland trainers. Vendors like Hanon, get manufacturers like New Balance & Saucony to make trainers for them. They command high prices on the second hand market or on Ebay! Try other retailers such as Working Class Heroes (Ulverston), Scene (Preston), Soleheaven (Newcastle). Sizes stop at 11, always the same.